An appeal launched by Editorial Photographers UK (EPUK) has raised £1,330 for the families of two journalists killed during the recent conflict in Georgia. The families of photographer and news agency head Sasha Klimchuk and journalist Giga Chikhladze received an equal share of the money after it was wired to them in Tiblisi, Georgia, last week. Giga’s widow thanked the EPUK not only for the donations, but also for the many messages of support, the statement said. This entry was posted in Journalism, Photography and tagged Editorial Photographers UK, GBP, Georgia, Giga Chikhladze, International, journalist, photographer and news agency head, Sasha Klimchuk, Tiblisi on October 27, 2008 by Stuart Goodwin. 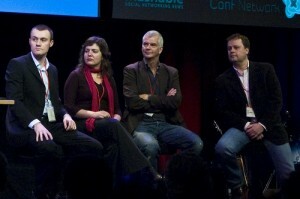 Bloggers Hugh McLeod, Loren Feldman, Pete Cashmore and Elisabeth Winkler get up on stage to answer questions from the floor and the live backchannel at Twitter. Pete Cashmore comes to the defence of bloggers and jokes that “sometimes we dress up and we wear pyjamas.” He describes the current media landscape as an eco-system where bloggers and journalists complement each other. Winkler sees the overlap between journalism and blogging in the connections between opinion and fact. However, a fact needs a context because everyone has an agenda, and the major media aren’t very clear about their agenda. She sees blogging as a little more transparent. Cashmore compares the discussion to the endless discussion that is still going on surrounding the term ‘web 2.0’. We spend a lot of time and posts on trying to define it, which leads to endless discussion, he says. The whole journalism versus bloggers debate depends on how you define journalism. Paul Bradshaw from the Online Journalism Blog enters the debate with his opinion that ‘is blogging journalism?’ is an old question and that we need more challenging ones. And me? I think the distinction between the medium and practice of blogging is an important one, especially in relation to journalism. This post originally appeared on Anne Helmond’s blog. This entry was posted in Events and tagged Anne Helmond, blog08, Bloggers Hugh McLeod, blogging, blogs, Elisabeth Winkler, Hugh McLeod, interaction designer, International, Loren Feldman, Online Journalism blog, Paul Bradshaw, Pete Cashmore, Rick Slagter, Twitter, Wilbert Baan on October 24, 2008 by Anne Helmond. Jonathan Elendu, who runs Nigerian news site Elendu Reports, was held without charge by the country’s State Security Service (SSS). This entry was posted in Editors' pick, Press freedom and ethics and tagged BBC, blogs, Elendu Reports, International, Jonathan Elendu, Journalism in Africa, news site, security services, State Security Service on October 24, 2008 by Laura Oliver. In the last session of the WAN/World Editors Forum 11th Readership Conference the speakers looked at shaping the future of the newspaper (information courtesy of WAN conference updates). While Karen Wall, assistant managing director of Metro in the UK, focussed on good old print, arguing that the free newspaper model was growing, Christian Ortner the editor-in-chief of the regional newspaper Vorarlberger Nachrichten, in Austria, took the WAN audience through his newspaper’s decision to become the ‘Yahoo for local search’ in their area. Vorarlberger Nachrichten Online is now aggressively pursuing online opportunities, forecasting that half its revenue will come from its digital platforms by 2011. ‘MyVillage’ hyperlocal websites, which deliver fresh and useful information to the users about their immediate neighbourhoods. The strategy for the online platform calls for lots of micro-sites on niche topics. A ‘mobile journalist’ team covering breaking news, with videos and photos. The ‘mojos’ focus on ordinary people and local stories. 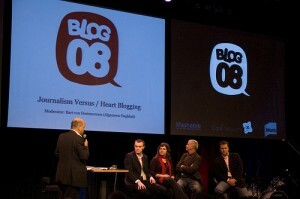 This entry was posted in Events, Multimedia, Newspapers, Online Journalism and tagged assistant managing director, Austria, Christian Ortner, director of Metro, editor-in-chief, free newspaper, google, International, Karen Wall, local search, Metro, mobile journalist, online opportunities, online platform calls, online upside, Vorarlberger Nachrichten, WAN, WAN Amsterdam, Yahoo, YouTube on October 20, 2008 by Judith Townend.